While we have seen Kinect-based virtual dressing rooms before, the team at Arbuzz is taking a slightly different approach (Translation) to the digital dress up game. Rather than using flat images of clothes superimposed on the subject’s body, their solution uses full 3D models of the clothing to achieve the desired effect. This method allows them to create a more true to life experience, where the clothing follows the subject around, flowing naturally with the user’s movements. [Lukasz] says that the system is still in its infancy, and will require plenty of work before they are completely happy with the results. From where we’re sitting, the demo video embedded below is pretty neat, even if it is a bit rough around the edges. We were particularly pleased to see the Xbox’s native Kinect interface put to work in a DIY project, and we are quite interested to see how things look once they put the final touches on it. This website should be called “Kinect a Day”. I’m not trying to be negative, but surely there is more news than this Kinect news? Very nicely done! The dancing frightened me, at first, but all was forgiven as the video went on. That is pretty cool. Hope he polishes it and gets rich off it. @Jay – You weren’t frightened by the virtual women’s clothing on the guy? The skirt was particularly odd, but the effect was kinda cool. Modify it to use armor from a game like Dragon Age or something, and it would be quite a bit more interesting to me. Holy cow, that will be easy to monetize! Good work! it’s a popular piece of hardware atm. when arduinos were popular there was one posted every day. now its kinect. lern 2 ride teh cool wave brah! It’s nice but it needs a lot of work and I’m not sure the kinect can offer the resolution required for it, I could be wrong. Clothes fitting is (at least for me) a fine art – and I’m no fashion guru. But a fault can be as small as how this hangs aruond your particular leg shape, or how this colour works with your skin colour and without decent 3d mapping of body curves and colour matching it#s going to be nothing but a gimmick. A fun one. I really wonder when people will be able to get that horrible lag out of the Kenect. Is it that these guys all own horribly slow PC’s or does the Kenect it’s self lag that badly? i like how he selected women’s clothing. also the dancing was nice for change instead of being all stiff. the non emotion on his face and contraction was kind of funny when he was dancing. @james he could of done it in a speedo to get a better fit. but i don’t think i would of liked the video as mush lol. There were systems like this before for virtual cloth fitting, but they were computationally expensive and difficult to set up (multiple cameras and so on). This should be easy to set up in a shop window so passing by women stop and try clothes = instant shop magnet. It works pretty well. Might be interesting to compare video frames to distinguish background from person (and existing clothes), and stretch the virtual clothing a bit to cover better. The video was very strange. The dude was very strange. But yeah that one dude could get full speed in his slow microcontroller to play pong and an old camera. Then you have a cutting edge microsoft product running windows. There shouldn’t be any lag. I’ed like to see somthing for video chat, I think it would be neat to chat in real time as a gorilla. does it come in plus sizes? Could anyone tell me what’s the name of the creator? 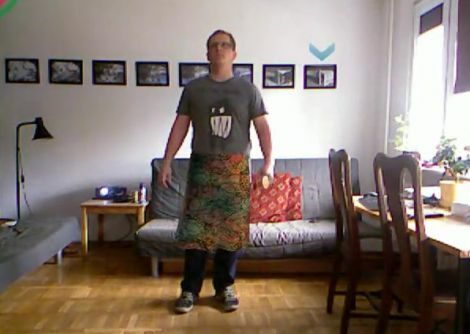 He has to model the shirt first so the kinect can take his 3d picture, right? or could anyone / any mannequin model it and still produce a decent 3d model on him? great work i am currently working on augmented reality its pretty hard to make software!